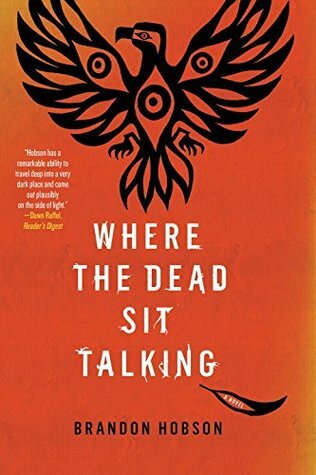 Set in late 1980’s rural Oklahoma, “Where the Dead Sit Talking” is the sad, dark tale of a 15-year-old Native American teenager named Sequoyah, sent to live with a foster family after his mother’s imprisonment. From the outset of the novel, it is evident that Sequoyah carries many emotional scars, having dealt with his mother’s alcoholism and abuse in previous detention settings. Harold and Agnes Troutt are also the foster parents of two other children: George, a younger, also emotionally damaged boy (his behavior strongly suggests that he’s possibly on the autism spectrum), and Rosemary, an older Native American girl with whom Sequoyah becomes obsessed. They bond over their shared heritage (he is Cherokee, she is Kiowa), smoking cigarettes in her bedroom at night and sharing their deepest secrets with each other. Their relationship is equal parts platonic and disturbing, with Sequoyah’s violent fantasies and obsessive thoughts of Rosemary taking up much of the novel. This book has a very dark, brooding tone all throughout. There is no happy ending or ‘triumph’ by the main character. What is here is an unsettling silence at the heart of the story that betrays the notion that even though everything seems ok on the surface, it’s apparent that it isn’t. Despite the Troutts kindness and “good” intentions, they are powerless to stop the human catastrophe that simmers beneath the surface of their home. I think the author does a great job of depicting how even the most well-intentioned acts of goodness can be misdirected and to the complete detriment of the individual. Great review! This sounds like a very interesting read, perhaps slightly disturbing read. I’m adding it to my tbr. Nice review! I also enjoyed this one. I wasn’t expecting something so dark, but I thought Hobson did a good job of drawing you into the story. Agreed! I definitely loved this book.